Purple Loosestrife has woody, square stems with purple flowers at the end. Purple Loosestrife has long, woody, square stems with 4–6 sides. The stem has smooth leaves which are arranged in pairs of 2 oppositely on the stem. The most distinguishing characteristic of Purple Loosestrife are the purple flower clusters at the end of the stem. Each individual flower has 5 or 6 petals. Spread across North America, and is present in every state except Florida. Present in wetlands, lakes, rivers, marshes and lakeshores. 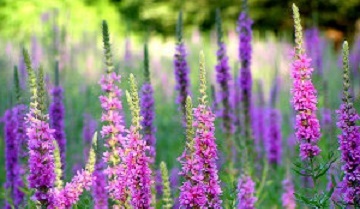 2, 4-D and Dibrox® are great herbicides used to treat Purple Loosestrife. You can learn more or purchase these products on our website.